In this lesson, we will learn how to tell whether events are certain, likely, unlikely, or impossible. Is this event certain, possible or impossible? I will play football this week. Is this event certain, possible, or impossible? The winter will be colder than the summer. A goat will fly past the window. If I jump up, I will come back down. If I throw a regular die, I will get a 7. 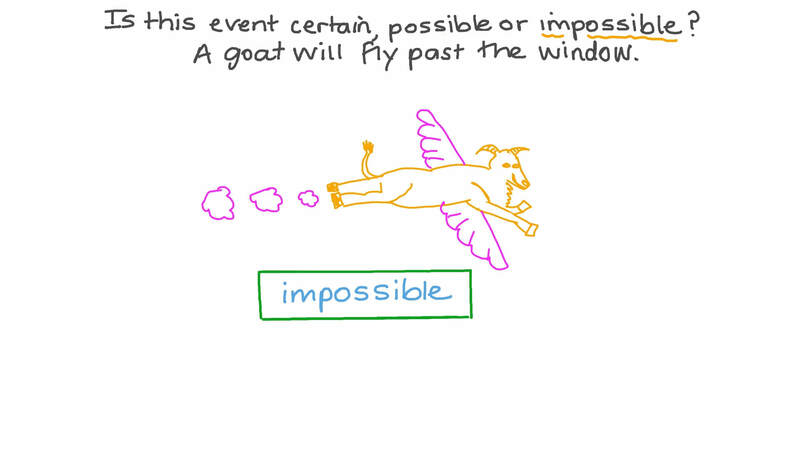 What is the probability of an impossible event? If there are three red balls and nothing else in a bag, is it certain, possible, or impossible that if I pick out a ball at random it will be red? Is it possible, impossible, or certain that someone watches television 4 times a week? Complete using certain, likely, or impossible: It is that a shark could swim to the moon and live happily. State whether the following is certain, possible, or impossible: A cube has six faces. What is the probability of a man living forever? Is it possible, impossible, or certain that someone on Earth saw the sun rising in the west this morning? State whether the following statement is possible, impossible, or certain: A student goes on a school trip. A spinner is divided into 10 equal sectors numbered 1 through 10. If the spinner is spun, is it certain, likely, unlikely, or impossible that it lands on a number less than 4? What is the probability of the weather tomorrow being sunny? Which of the following might represent a probability? Shady has 19 coloured beads in a bag: 2 are red, 6 are blue, 4 are green, and the rest are yellow. If he selects one at random without looking, is it certain, likely, unlikely, or impossible that a yellow bead is chosen? Fares writes numbers on separate pieces of paper. He puts the pieces of paper in a bag and selects one without looking. The number 1 is written on 9 pieces of paper, the number 2 is written on 8 pieces of paper, and the number 3 is written on 6 fewer pieces of paper than the number 2. Is it certain, likely, unlikely, or impossible that he picks the number 1 or 2? If this spinner is spun once, it is certain, likely, unlikely, or impossible that it stops on an even number? What is the probability of an event that is certain to occur? A spinner has 35 equal sections of which 4 7 are blue, 2 3 5 are red, 1 3 5 are orange, and 1 2 3 5 are purple. When the spinner is spun, it is equally likely that the pointer lands on any of the sections. What is the most probable colour for the spinner to land on? What is the probability of rolling a number which is greater than 6 on a fair die?